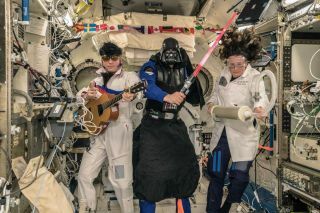 From left to right: Russian cosmonaut Sergey Prokopyev, European Space Agency astronaut Alexander Gerst and NASA astronaut Serena Auñón-Chancellor dressed up for Halloween at the International Space Station on Oct. 31, 2018. Happy Halloween from the International Space Station! The space station's three current inhabitants posed for some spooktacular group photos in their out-of-this-world Halloween costumes and beamed the pics down to Earth today (Oct. 31). "Having a scary day in space," European Space Agency astronaut Alexander Gerst tweeted. If you look closely at Auñón-Chancellor's coat, you'll notice the letters "M.D." after her name and "Class of 2001" beneath that text. Auñón-Chancellor was a flight surgeon before she became an astronaut, and she earned her medical degree from the University of Texas Health Science Center at Houston in 2001. So, her lab coat probably didn't come from a costume shop. And because she does science experiments in space every day, the safety goggles for her costume were conveniently aboard the space station long before she created her costume. As for Prokopyev and Gerst, their costumes and props had to be shipped up the the space station with a cargo-resupply mission during either Expedition 56/57 or a previous expedition. Several guitars and other instruments are currently stored at the orbiting laboratory. Because the crew dresses up for Halloween every year, some aspects of their costumes may have been left behind by previous inhabitants. The three Expedition 57 crewmembers currently in space are scheduled to return to Earth on Dec. 13. Their replacement crew is scheduled to arrive in early December; that team will consist of NASA astronaut Anne McClain, Canadian Space Agency astronaut David Saint-Jacques and Russian cosmonaut Oleg Kononenko.